It all began in December 1984 when a bunch of friends about to celebrate their birthdays decided they would have a party. There was a suggestion of having a disco; no I cried out, you've got to have a live band. Where do we get one at such short notice they said," I'll get one", I said. I rang around all my musician friends and within a couple of days we had a band. Now we had the band, what about a name? Sandra, a Canadian girl I was seeing at the time, suggested, as there were three Irishmen involved, why not call it Paddy Goes To Holyhead! The line up on that night was Danny Hynes Lead Vocals, Mal McNulty Guitar/Vocals, Jimmy Gaynor Guitar/Vocals, Brendan Finglas Bass & Herman Drums. Plus a variety of other players who got up and did one or two numbers. It went so well that I thought; maybe I should do a few more gigs, while awaiting release from previous contracts. We did a few one-off shows over the following months before Jimmy & Brendan, the other two Irishmen, moved on to pursue other projects. I then decided that Paddy would be a FUN band; doing the songs I liked and with musicians with a similar outlook, serious players but with tongue firmly-in-cheek! 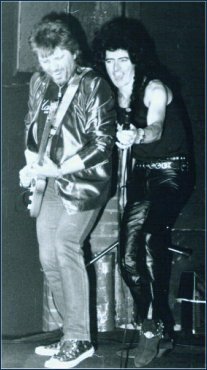 During this time Andy Scott, who I'd become friends with a few years earlier when he produced some demos for my previous band Weapon, would occasionally come along to a gig a guest with us. 1986 and I was having so much fun with the band I decided it was time to get it down on tape. I asked Andy if he would like to produce the sessions. So with the line up of Mal McNulty, Jeff Brown, Bruce Bisland,Phil Lanzon, then of Sweet and now Uriah Heep, on keyboards we went into London Bridge Studios record The Green Green Grass of Home. Andy also played guitar and sang backing vocals. It was then I invited him to join the band on a more permanent basis, which he did, until the reformed Sweet went back on the road full time. When he left he was replaced by Tino Troy (Praying Mantis) who I'd been friends with for many years. We worked this line up for a couple of years before we all parted company. I continued with Paddy while the rest of the guys formed The Wandering Crutchlees. For a period of time I had several short-term line-ups using musicians whose regular bands were off the road. These included Syd Twynham (Mud) and Bass players John Berry (Mud/Slade 2) Phil Spalding (Seal/Mick Jagger Band) and even the late great Mick Tucker (Sweet). Mick was member for about two months between May & June '89. Culminating in a headline show at the legendary Marquee Club, Charing Cross Rd, London on Saturday 20th May. The full line up that night was Pete Bullick Guitar/Vocals, Des Duffy Guitar/Vocals, Phil Spalding Bass/Vocals (and lots of energy!) & Mick Tucker Drums. Paddy Goes To Holyhead is one of the few rock bands to have played at both the old and new Marquee Clubs. In July '89 Gareth Thomas and Ian Morgan were drafted in to replace Phil & Mick, who had returned to their proper jobs! In September we were offered, and accepted, a two-month tour of Dubai. Des & Ian decided not to go, for personal reasons, so I invited Syd Twynham and along with session drummer Jan Alkema off we went. Ah the fun we! On our return Syd rejoined Mud who was about to go out on tour and Jan went back to teaching/session work, replaced by Heavy Metal Kids drummer Keith Boyce. We carried on as a four-piece. Some months later Gareth Thomas decided he needed a change and was replaced by Terry Horbury. We continued working with this line up until 1992 when I invited Andy Burgess (guitar/vocals) to join, thus elevating the band to another level. In 1993 Pete & Keith got involved in recording and live work with Debbie Bonham, Pete would eventually go on to marry Debbie! As a lot of our work clashed, it was decided they would commit full time to Debbie's band. Replaced by John Fraser-Binnie guitar and, after a lot of stand-in drummers, Alf Main. With this line up we went into Surrey Sound Studios to record our debut album "Greatest Hits" (and other fairytales) produced by a young New Zealander named Simon Shazell. The album was released in August 1997. In March 1999 Johnny & Terry left, replaced by the Troy brothers, Tino & Chris adding a new dimension of sound and influence creating the most exciting Paddy line-up ever! Simon Jeffery replaced drummer Alf Main in 2003. In early 2006 Simon's other projects meant he could no longer commit to Paddy. Whilst looking for a full time replacement the band have secured the services of a temporary drummer, American Benji Reid. Benji has a very impressive cv, having worked alongside the likes of Derek St Holmes (Ted Nugent vocalist) Deborah Bonham, Pat Cash, The Barnstormers, Doogie White (Former singer with Richie Blackmore's Rainbow) and John Lawton Band (former Uriah Heep vocalist) to name but just a few! He was also voted Best Drummer on the London club circuit at the 1999 'The Dog's Bollox' awards. Over the years I have had the pleasure of playing with some of the finest musicians around. most of who I'm still on good terms with! Paddy Goes To Holyhead's first official show was on St Patrick's Day 17th March 1985 at The Greyhound, Fulham Palace Road, London and on that date in 2005 our 20th anniversary was celebrated ! March 2009 saw the band return to the studios to start work on a new album. To be released in late July. Paddy Goes To Holyhead played their 1st 'offical' gig on St Patrick's Day, 17th March 1985 at The Greyhound, Fulham Palace Road, London W6. On that date in 2015 they will celebrate their 30th anniversary somewhere in London with, subject to availability, a selection of former members making guest appearances.